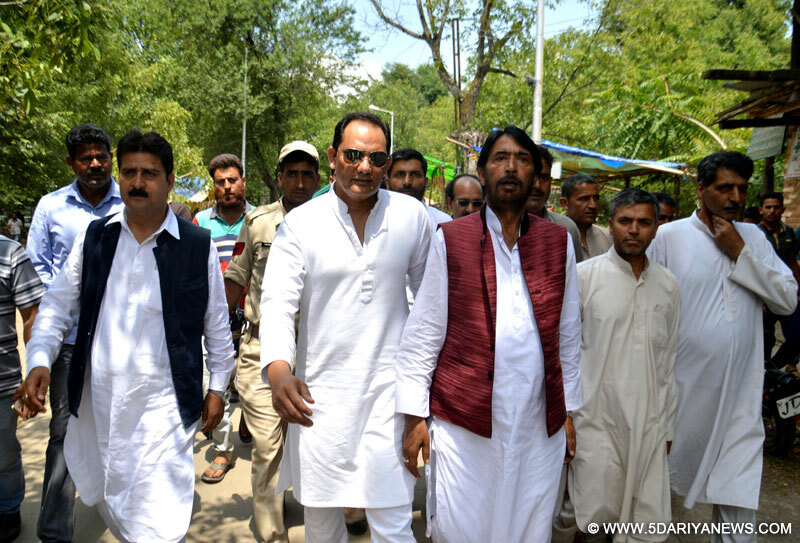 Congress leader and former cricketer Mohammad Azharuddin with Jammu and Kashmir Congress chief G A Mir during a road show in Anantnag on June 20, 2016. Congress today reiterated its commitment to overall development of the State, serving & strengthening the people. The Party also urged upon the people to defeat PDP as defeating PDP tantamount to defeating RSS and BJP.Leading a mega road show in Anantng today Senior AICC Leader Azharuddin (Former Captain of Indian Cricket Team) and JKPCC Chief G.A. Mir reiterated Congress Party’s commitment to overall development of the State and people. Both the leaders urged upon the people to cast their vote in favour of the Congress Candidate Hilal Ahmad Shah, for the fact, it is the Congress Party alone which stands guarantee to safety and security of the people.Campaigning for the Congress Candidate today in Anantnag Azharuddin, while addressing a large public gathering after concluding the mega road show, urged upon the voters of Anantnag to cast their vote in favor of the Congress Party Candidate. He emphasized the need to strengthen the secular forces in the State as their vote to Congress Candidate shall be a vote to Secularism, Unity, harmony and togetherness in the State.He told the large gathering that Congress Party while having never compromised on its stated position of safeguarding the multi-cultural identity, unity, harmony and togetherness in the Country defeated the forces posing threat to atmosphere of brotherhood and amity in the Country.